The solid arrows indicate power relationships involving flows of money. Dotted arrows denote other types of power. Sales and purchases are not shown separately in this diagram as flows of money. Instead, the difference between them is shown, as the wealth created: the amount by which the price paid by a customer exceeds the cost of supplies consumed. People create wealth by working, or by employing labour, to produce goods or services which are sold to customers: individuals, companies and governments. Customer demand is a pre-requisite for wealth creation. Wealth is created when goods or services are paid for. Wealth creators can then spend some of the profit. The larger arrow in the diagram emphasises its importance: the desire to spend is the principle incentive for creating wealth. Wealth creators might also pay some money into the financial system, as savings, loan repayments, or payments to investors. Individuals, businesses and governments all make use of the pool of available finance. Governments provide collective benefits and public services; they have several ways of deducting taxto pay for this. Facilities and infrastructure are needed to create and distribute wealth. People who work in the financial system, and those who build and maintain facilities and infrastructure, are also wealth creators. 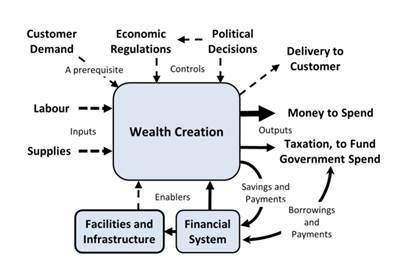 Intermediate transactions between businesses are all subsumed within the process of creation of wealth in this diagram; wealth creation is complete when the end-customer pays. With minor adjustments, this model applies to any level of wealth creation: a person exchanging labour for payment, a business, a country or the global economy. The entire structure of relationships is subject to a hierarchy of regulations and political control. This summary of an economic system illustrates its interconnectedness and its dependence on the availability of resources. From the perspective of an individual employee, for example, who supplies his or her labour to an employer, the label ‘facilities and infrastructure’ might be interpreted as a car used to go to work; the ‘supplies’ might then be fuel; the wealth earned would be divided between the employee’s own consumer spending, taxes paid to the government and money paid into the financial system in the form of bank charges, savings or loan repayments.